Starting 1st of April 2018 Th.D. Pauliina Kainulainen will start a three-year period as monastery chaplain. He duties will include organizing events and activities in the Enonkoski monastery as well as programs and cooperation with congregations in the Mikkeli ja Kuopio evangelical Lutheran dioceses. The aim is together to enable deeper communion with Christ through spiritual guidance, prayer and retreat activities. 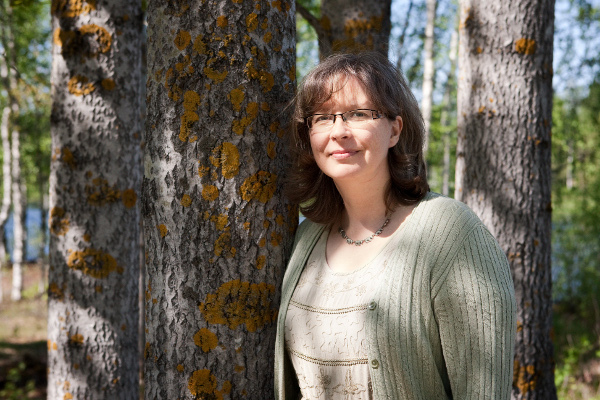 Pauliina Kainulainen has in-depth experience of organizing silent retreats. Her extensive theological publishing activities has especially involved the relationship of experiencing nature and spirituality. Upcoming events can be found in the event calendar. The monastery primarily serves guests in Finnish. Mostly, it does not present any problem to receive non Finnish speaking guests as participants in the monastery. We want to give you a warm and forthcoming welcome and provide you a pleasant stay. Therefore, for any events, you are advised to consult us in advance about suitability of programmes for guests not speaking Finnish so that we can provide all possible assistance in overcoming the language barrier. Altarpiece of the Chapel of Holy Trinity, Enonkoski Monastery. The Monastic Community of Enonkoski is an ecumenical community based in the Lutheran confession. It exists so that people would have a place for peace and prayer in their lives. 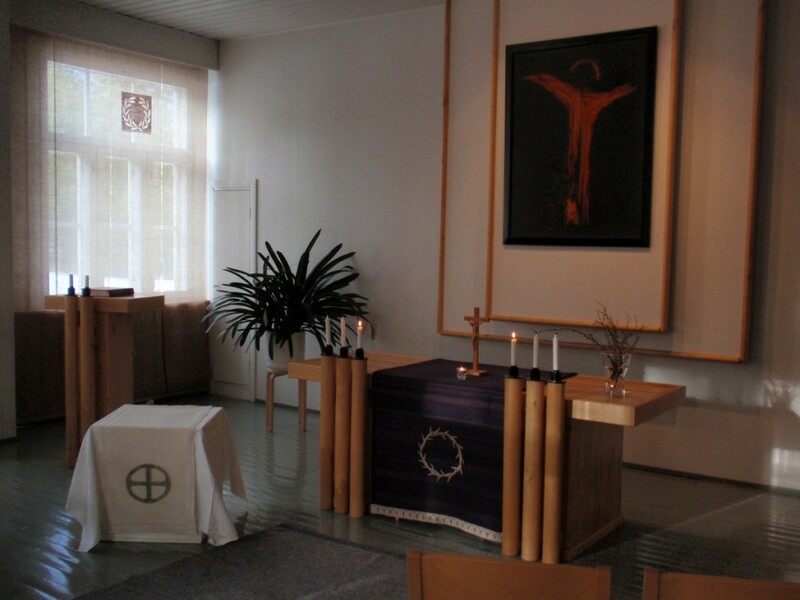 The Monastic Community’s meeting place is a former school building in the village of Ihamaniemi, in Eastern Finland. The Monastic Community’s chapel, the Chapel of the Holy Trinity, is the heart of the Community’s activities. The Monastic Community is independent, but it functions under the auspices of the Bishop of the Diocese of Mikkeli, as well as in cooperation with the Parish of Savonlinna. Silence retreats, monastery weeks, different events, and a monthly mass kept by the local parish are organized at the Monastery. The Monastery is open for quiet prayer sessions at separately notified times. The Monastic Community works to maintain a vision of the inner knowledge of Christ as a counterbalance to a kind of Christianity characterized by doctrinal and functional emphases. The Christian is to find strength within the fellowship God and other disciples, in a spirit of endeavor and prayer, as well as finding direction in his or her life. The Monastic Community can be a group of sojourners in faith, who are learning how to live in the discipleship of Jesus, regardless of their own life situation or geographical location. The Monastic Community of Enonkoski does not operate as a religious order, but it sends its members to perform different tasks in their own home villages, towns and cities or at the Monastery of Enonkoski. As a place the monastery calls people to meet one another and to pray together. The Monastic Community is also a community of prayer, which serves the whole Church and its parishes by praying on their behalf, and by strengthening the vision of personal spiritual guidance and devotional support for parishioners. The Monastic Community creates and presents models for building prayer as a natural part of the modern person’s daily life – even for those people that have never prayed or have said that they do not know how to pray. One tool for reinforcing a life of prayer is the collection of prayers published on the Monastic Community’s website, as well as the prayer application for smartphones. With the help of these tools it is possible to quiesce in prayer regardless of one’s location. The Monastery receives donations in order to sustain its activities from the Central Church Board of the Evangelical Lutheran Church of Finland and from the Evangelical Lutheran Parish of Savonlinna. Most revenues are comprised of donations given by participants of organized activities, participation fees, as well as the sales of handcrafted goods and foodstuffs. Services are mostly produced by volunteers. All Christians that want to live as Jesus’ disciples, growing in the grace of God, praying and serving, are called to be members of the Monastic Community. The Monastic Community can offer a pilgrim the fellowship of fellow sojourners, so that together we may be strengthened in Christ and in the power of the Holy Spirit. According to our experience, the Monastery of Enonkoski is a place to which a person is summoned by God’s special invitation. One may work in the Community as a managing volunteer or as a permanent resident, but for briefer periods of stay as well. God calls us to the Monastery in order that we may find clarity and peace in our lives. The experience of the Community’s members has been that God is present in the Monastery in a special way. In order to reinforce the commitment of being a member of the Monastic Community of Enonkoski, one may take a voluntary vow of endeavoring in faith. Chapel of Holy Trinity at the Enonkoski Monastery. The Monastery is open during the monastery weeks. During this time it is possible to visit there for a few days and even longer, depending on the general situation. During retreats, the Monastery is open exclusively to those participating in the retreat. On Sundays there is no morning or midday devotion. Instead there is a 10:00 Mass held at the Church of Enonkoski. At preannounced times Mass will be held at 13:00 in the Chapel of the Holy Trinity. Groups are warmly welcome to visit the Monastery by reservation. Groups with 13 members and under can be offered accommodations on the condition that there is no other activity at the Monastery at that time. It is possible to organize different events for different kinds of groups in the Monastery, in cooperation with the Monastic Community. The Monastery can also be rented exclusively for briefer periods to a given group, for example a retreat, a camp or a course. The Monastic Community will help with the organization. It is possible for the organizer to receive assistance with food services and other arrangements from the local village and the Monastic Community. The Monastery’s guests pay 60€ per day for room and board. A”self-motivated” guest with his or her own bedding will be charged at a reduced rate of 30€ per day. The price includes accommodation in a single room and meals (breakfast, lunch, afternoon coffee, dinner). The reduced rate is applied when the guest participates in Monastery chores. 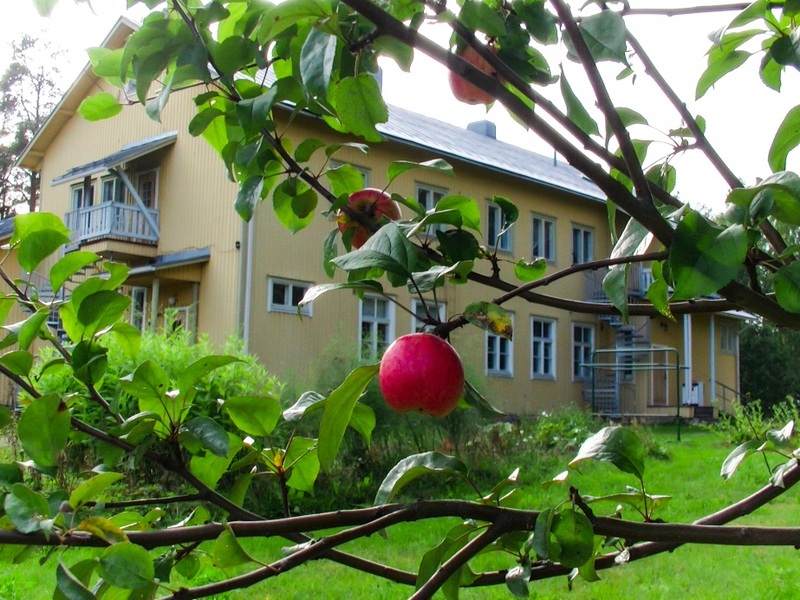 The activity of the Monastic Community began in 1994-1995 when the Ihamaniemi’s school building was transferred to the control of a support association and the first residents moved into the Monastery. The Chapel of the Holy Trinity was consecrated in 1995. The beloved Finnish hymnodist Anna-Maija Raittila wrote the words of the Monastic Community’s own hymn for the consecration ceremony. The Monastery’s permanent residents have lived at the Monastery, depending on their own life circumstances, for varying lengths of time. At this time there are no permanent residents. The beloved Finnish hymn writer Anna-Maija Raittila wrote the text for the hymn of the monastery. It can be sung to the French tune (1557) of advent hymn of the Hymnal of the Evengalical Lutheran Church of Finland. thus in a tiny seed. In us it will then hide. In us it will be growing. the seed will fall apart. but sliding to the dark. the font of force is drying. 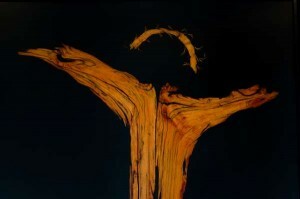 the hope´s new beam of light. the faith of growing spring. the Lord himself will water. but trust his children all. Christ is himself the way. He is our will’s strong tower. and knows where leads our way. In the Monastery there is the Chapel of the Holy Trinity, a dining room and meeting room. In both the chapel and the meeting room there is room for 40-50 people. A shop and a handcrafts workshop are located downstairs. Up to 13 guests can be accommodated in simple, clean single and double guest rooms in the upstairs of the Monastery. A common bathroom and shower are located in the hallway. A small sauna is located downstairs. A larger sauna, a washroom and a sauna room are located in a yard building. The Monastery is surrounded by a garden, which has a garden plot for vegetables, flowers, berry bushes and apple trees. A pavilion, a campfire site, and a prayer path with devotional text stations are also located in the garden. Ihamaniemi is a naturally beautiful village near Lake Saimaa. Near the Monastery there is a swimming beach on the shore of Mustalampi. The village’s common beach, with its grilling and swimming possibilities, is about a kilometer from the Monastery. There are also hiking trails around the village. There are many sites of interest near the Monastery: the Linnansaari ja Kolovesi national parks, many nearby churches, including the the world’s largest wooden church in Kerimäki, the city of Savonlinna and its medieval fortress, Olavinlinna. The Finnish Orthodox Valamo Monastery and the Cloister of Lintula are also nearby. The easiest way to get to the Monastery is by car. The drive from Helsinki, which lasts under 5 hours, is 380 kilometers. You can get easily to Savonlinna via train and bus. From Savonlinna it is only 40 minutes drive to the monastery and it is possible to arrange for transportation to the Monastery upon request. There is no public telephone or internet connection at the Monastery. Each person may use their own modes of communication. The Monastery is within a 3G mobile coverage area. Fees and donations can be paid to the Suomen evankelisluterilaisen luostarin tuki ry:n bank account IBAN FI70 5650 1840 0193 84 (BIC OKOYFIHH). To all who are interested in activities at the Monastery, we cordially welcome you to the Monastery and Ihamaniemi! We request that guests personally contact the Monastery, so that we may better help in arrangements pertaining to visiting and travel.